‘Remembering Yuri Kochiyama’ at Cal State L.A.
You are at:Home»English»Life & Arts»Art & Design»‘Remembering Yuri Kochiyama’ at Cal State L.A.
An exhibit titled “Remembering Yuri Kochiyama Through Grassroots Art” is on view at the Cross Cultural Centers at Cal State Los Angeles until Friday, Feb. 12. 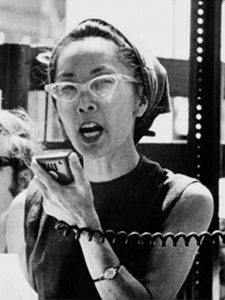 Yuri Kochiyama (1921-2014) was a Japanese American activist who was a cornerstone in both the Black Power and Asian American liberation movements. She fought hard to break social expectations of people of color, and believed that the youth “should do everything to offset that pattern.” Her voice, passion, and power contributed to change in the U.S. The Cross Cultural Centers are located at 5154 State University Dr., Room 206, U-SU. Office hours are 8 a.m. to 7 p.m. Monday through Thursday, 8 a.m. to 5 p.m. Friday. The phone number is (323) 343-5001. The mission of the Cross Cultural Centers is to encourage student learning as well as foster an inclusive campus environment that challenges racism, sexism, heterosexism, and other forms of oppression. With a commitment to increasing cross-cultural awareness, it offers a wide variety of programs and services that explore both the shared and unique experiences, histories, and heritages of the university’s diverse community.